Abhisarika Holidays is a Prominent Tour & Travel Agent in Guwahati, Assam that Boasts of Providing the Best Tour & Travel Services to Its Most Esteemed Clients. Out of the Many Services, We also have Travel Insurance Services for Our Clients Who are Travelling Abroad. 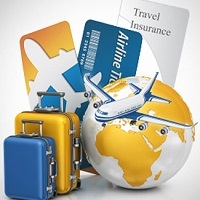 Our Travel Insurance Services are the Best Taking Care of Clientsâ�� Exclusive Needs and Requirements. We At Abhisarika Holidays Know that Travelling Outside Home Can Call for Many Unwanted and Unnecessary Issues like Baggage Loss, Baggage Delay At the Airport and also other Medical and Non Medical Expenses to Help Clients with These Hassles and Panics, We At Abhisarika Holidays, have Designed Exclusive Travel Insurance Plans for Our Clients So that They Can Benefit from These Plans. You Can Now Avail of Benefits like Baggage Loss/delay and Unique Facilities such as Cashless Hospitalization, Worldwide.